Since the end of the Cold War, Sweden has gradually left the cocoon of neutrality in favour of integration into the formal structures of the West. But Sweden still hesitates to take the step of joining NATO, despite having a considerable security deficit now that Russia is once again considered a threat. This hesitancy is largely due to the powerful pull of a past long separated from the European mainstream, a past where neutrality was seen as morally superior and a part of national identity. This emotional pull makes reappraisal and revision both painful and potentially politically costly. Like most European states, Sweden really believed that Eternal Liberal Peace had broken out in the 1990s, and radically cut its armed forces as a result. Now that Russia is once again a manifest threat to the region and has discarded the European Security Order, there is a strong and urgent sense of vulnerability. Moreover, most of the traditional arguments in favour of non-alignment have become irrelevant. 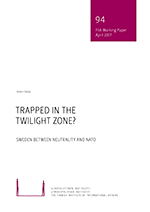 Public and political opinion has shifted towards membership of NATO as soon as possible, but a sizeable segment of the population and the political class still regards the Alliance as anathema. The current centre-left government is trying to square the circle by pursuing very close defence ties bilaterally with the US and Finland, as well as with NATO, while remaining formally unaligned. This has succeeded to an amazing degree.